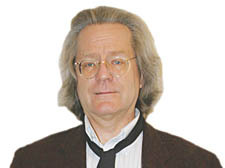 WITH his wavy, whitening hair, and balanced demeanour, AC Grayling is quite the philosopher. But on Wednesday night in Marylebone Daunts bookshop, the author and philosopher appeared to lose his rag. His new book Towards the Light (Bloomsbury Publishing £20) is a history of the “liberty of conscience”. Grayling holds high hopes for Gordon Brown, but has a deep contempt for New Labour and what he believes is its10-year assault on our individual freedoms. “I’m sorry, but David Blunkett really agitates me,” he says. “Take the ID cards. The government is so worried about people hacking into their databases that they are actually considering attaching little discs in our earlobes so we can be zapped like a bag of oranges in the supermarket. It’s on their website if you don’t believe me. “I read a story about a car manufacturer that developed fingerprint technology for drivers instead of keys – so the cars could ­never be stolen. Well it turns out some thieves cut the fingers off the drivers to get into the car. “The political abuse of systems is actually not the point – it is too much the conspiracy theory. It is that that changes the relationship between the individual and the state. “Three years ago David Blunkett jointly published with the US a report stating that protecting the security of the people was the most important thing a government could do. This is a falsehood.